Save 15% on ALL MaterNatura products until 24.04.2019! Fabulous natural cosmetics suitable for the whole family. Discover our collection of 100% mineral, natural & planet-friendly sun care products today! We're dropping the prices on kivvi's Skin Renewals product line. Enjoy 20% off the collection until 28.04.2019. Save 15% on the semi-permanent hair dyes by ColourWell. For an intensive colour payoff, lasting shine and revitalised hair. The purely natural sunscreens enriched with mineral filters by ATTITUDE are now on sale! Save 15% on the Skin Sensitive Sunscreens until 12.05.2019! Try out the Weleda Sun Protection range: cooling, regenerating care that guards the skin in a natural way! Now less 20% through 01.05.2019. Banish oily skin with essentiq's line of effective cosmetics that targets excess sebum. Enjoy 20% off selected products until 28.04.2019. Subscribe today and receive the latest beauty news, special offers & promotions sent straight to your inbox. 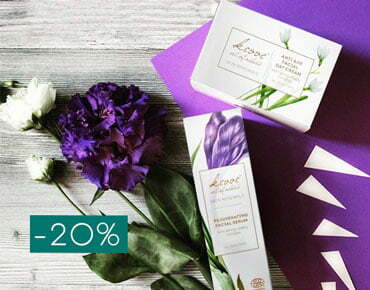 Spend € 29.99 on the PURE SKIN FOOD collection and score a FREE Dental Oil while stocks last. We'll add a FREE Royal Essence Moisturising Fluid to your order with every Royal Essence Regenerating 24h Cream 50 ml purchased! Only while stocks last. veg-up: natural cosmetics in eco-friendly packaging. Bag a free Eye or Lip Pencil when you spend €24.99+ on their assortment! Only while stocks last. essentiq has developed a skincare line that addresses the needs of teenage skin.